The new Mazda6 has been designed to garner admiring glances while changing the perception of what an economical sedan can do. Experience affordable opulence today at Biggers Mazda. Apply Mazda ingenuity to a sport sedan, and you have the Mazda6, equal parts stylish and practical. 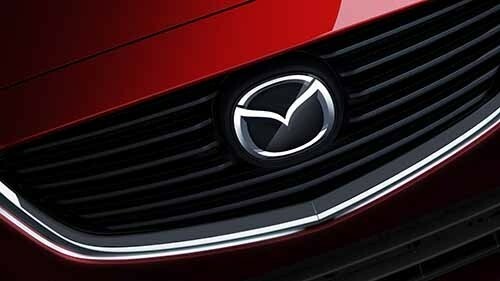 Mazda engineers believe that drivers shouldn’t have to compromise on performance or efficiency, so Mazda engines are optimized to enhance driving dynamics and fuel efficiency. Standard on every Mazda6, this infotainment system provides information and entertainment via a full-color touch-screen display. This available system provides the likes of Rear Cross Traffic Alert, a Lane Departure Warning System, Lane-Keep Assist, Advanced Blind Spot Monitoring, and more. Get in your car and take the streets of Elgin quickly and easily thanks to Remote Keyless Entry. Simply have your key fob on you to enter your Mazda6. If you are in search of sedan that doesn’t break the bank but has all of the style and sophisticated touches you desire, look no further than a Mazda6 for sale at Biggers Mazda. In addition to its good looks, the latest Mazda6 model has been designed with innovative safety in mind, which is evident by its IIHS Top Safety Pick+ distinction (when properly equipped). Add in all of its advanced tech features, and the choice is clear. Why wait to set up your test drive? Experience the Mazda6 in Elgin today at Biggers Mazda. Just what can you expect when you take a new Mazda6 for a spin? You can look forward to an adrenaline-pumping drive that may surprise you. The Mazda6 is equipped with a 2.5L engine featuring SKYACTIV® TECHNOLOGY, which delivers 184 hp and 185 lb-ft of torque. Its aerodynamic design is not only visually appealing, but functional as well, contributing to outstanding fuel economy and high-speed stability. If the new Mazda6 has piqued your interest, stop by Biggers Mazda today to experience it in person.